Some people swear by solar lighting. Others won’t go near it. While the naysayers cite “good reasons,” their dissatisfaction is not warranted in 2012. Solar lighting continues to gain in popularity, largely due to the “Go Green” movement and rising utility costs. Installing lights without electricians or disrupting your garden beds, lawn, landscape or paved or stoned areas certainly doesn’t hurt either. More and more, solar lighting is highlighted on popular television channels such as HGTV, the DIY Network and the Fine Living Network. Brighten Thing Up with Decorative Solar Lights! Start Thinking About Spring & Summer Fun! It’s winter and in many area of North America, it’s cold and bleak, so we want to brighten things up by talking about Decorative Solar Lights! Instead of discussing nuclear plants and solar lighting, online scams, or the benefits of solar products during emergencies, this post focuses on the fun and attractive solar lights available for your garden, patio, pool and more. While many people thing of string lights in terms of ornamental outdoor lighting or fancy accent lights, there’s a lot more options for decorative solar lighting available. Springtime will be here before we know it, making now a great time to look at some of the “lighter” sides of solar powered products! 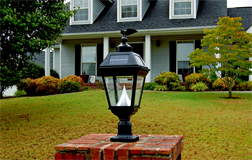 Lamp posts at the entrance to your property, along your driveway, or near your front door not only welcome you and your guests, they add safety to your property. As with all lights, solar lamp posts can also help ward off unwelcome company. Somebody recently told me “forget about solar lights, they don’t give off much light.” Baloney! In the past, this may well have been true but not today. Modern solar lamps incorporate state-of-the-art engineering in all components and come in a variety of styles to meet a variety of tastes to match the decor of your property. Whether or not you support or hate nuclear power, most nuclear plants in the United States aren’t going anywhere any time soon. The purpose of this article is not to debate the pros and cons of nuclear power. The subject actually is a bit ironic: did you know that several nuclear power plants and major utility centers around the country are now or soon will use solar lighting for perimeter security, particularly as back-up when there are natural or intentional power outages. While much information is publicly available (but difficult to find) about which plants are doing what and where, we are not publishing it in this article. We found out in a round-about way and did research to see how prominent the practice of using solar for perimeter lights actually is.